We ended this year of events with a bang in the form of the brilliant writer, academic and comedian A. L. Kennedy. With special pre-publication copies Alison discussed her new book 'The Little Snake' - a moving and wry fable of our times about love, war and a life lived with kindness. Signed copies now in stock. What a fantastic 10 days we had and here is a round up of our events. Naturalist and photographer Polly joined us to discuss her book 'A Richness of Martens', her life on Ardnamurchan and the wildlife and landscape that inspires her work. Robin joined us in the shop for a chat about his book 'Peatlands', the outer hebrides and the impact it has on the landscape and lives of those who live there and work with peat. 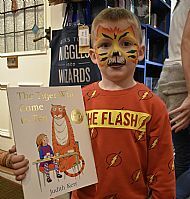 Children's author Vivian and author illustrator Cathrine wowed the crowd with fantastic story-telling, an illustration workshop and the exciting creation of a possible new book, Geraldine the Giraffe. The queen of crime did not disappoint. 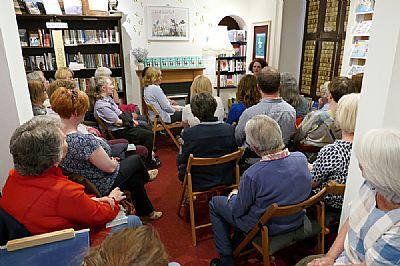 At a sell-out 130 strong crowd in Biggar Library Val discussed her life and work and read from the new Karen Pirie novel 'Broken Ground'. 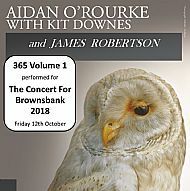 Aidan O’Rourke, Kit Downes & James Robertson with their “365 Special” show of stories and music. What a sparkling array of performers for a concert to raise funds for one of Scotland’s most significant literary landmarks, Brownsbank Cottage. Thank you to everyone who came along and supported this project. Brownsbank Cottage at Candymill, three miles north of Biggar, was the home of the poet Hugh MacDiarmid for more than thirty years until his death in 1978. MacDiarmid was arguably the most significant Scottish cultural figure of the 20th century. Saved for the nation by Biggar Museums Trust, it was home to a succession of contemporary writers between 1993 and 20??. Now in the hands of a new Trust dedicated to restoring the cottage and making it once again a centre for local, national and international literary activity, Brownsbank needs your help. All profits from this event will go to securing MacDiarmid’s Brownsbank for present and future generations. 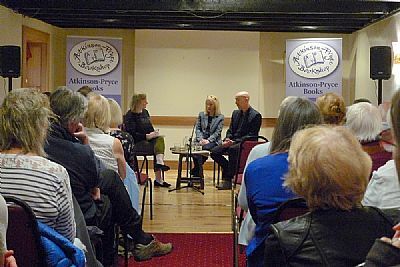 AMBROSE PARRY (aka Chris Brookmyre & Marisa Haetzman) were at the Elphinstone in Biggar, interviewed by author and literary crtic Lesley McDowell in what proved to be a fascinating and entertaining evening. 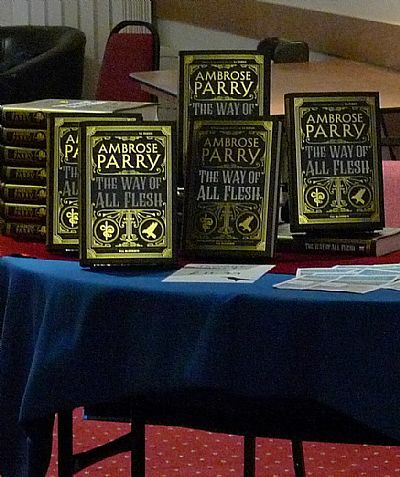 Medicine, murder and money blur the lines between class and gender in Edinburgh, 1847, in "The Way of All Flesh", the first historical mystery by Ambrose Parry - a collaboration between Marisa Haetzman, an anaesthetist and medical historian and award-winning, best-selling author Chris Brookmyre. Signed copies now in stock! Christian Small lived and painted in West Linton for over 60 years but her work is virtually unkown. This beautiful volume of exquisite artwork tells a story of family, the legacy of war, women's place in society, motherhood, community and, above all, one woman's extraordinary artistry. 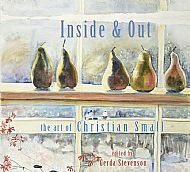 Woven in and out of the paintings are poems by Gerda, and Christian's thoughts in prose as imagined with poignant eloquence by her daughter Jenny. We were delighted to welcome to the shop the wonderful Mary Bromilow and her book 'The Clydesdale: Workhorse of the World'. One of Scotland's unsung exports, the Clydesdale horse was once used in farming, commerce and war. Mary Bromilow has reserached the breed and has lovingly collated the history of this magnificent creature along with an archive of beautiful photographs. The wonderful and talented husband and wife team Sarit and Itamar of Honey & Co. joined us in St. Mary's Hall for a mouth-watering cooking demo and conversation. There were laughs, great smells, tasty bites and useful information, hints and tips on cooking Middle-Eastern food at home. We have signed copies now in stock. 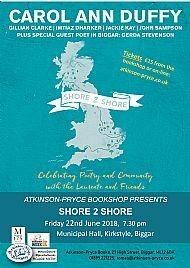 The fabulous Shore 2 Shore team were back in Biggar for another unforgettable evening during Independent Bookshop Week celebrating bookshops, community and, of course, poetry. 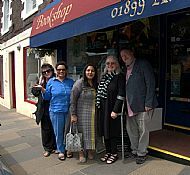 Carol Ann Duffy, Jackie Kay, Imtiaz Dharker, Gillian Clarke, John Sampson and local guest poet Gerda Stevenson put on another incredible performance and the evening was dubbed by one customer as the 'rock & roll of poetry'. 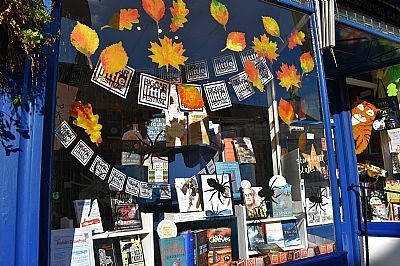 We have lots of signed stock including the early release to Independent Bookshops only of Off the Shelf at £8.99. Maggie O'Farrell was at Atkinson-Pryce at 7.30 pm to celebrate the publication in paperback of her memoir "I am, I am, I am: Seventeen Brushes with Death". The author entertained a full house with readings and stories from the book. The extra space our new area created made for a larger crowd and it was a lovely evening all round. I Am, I Am, I Am: a childhood illness, a teenage yearning to escape, a terrifying encounter on a remote path, a traumatic labour and two near drownings are just a few of the author's terrifying experiences. GERDA STEVENSON was at the bookshop to celebrate her latest collection of poetry 'Quines: Poems in Tribute to Women of Scotland'. Poems givings voices to 67 remarkable women of Scotland from BC to the 21st century. This powerful and unique collection is a new landmark in the fine tradition of Scottish women's writing from a renowned poet and performer. Gerda is also joining us as the guest poet for Shore 2 Shore on Friday 22nd June 2018. Signed copies of 'Quines' are now in stock £9.99. 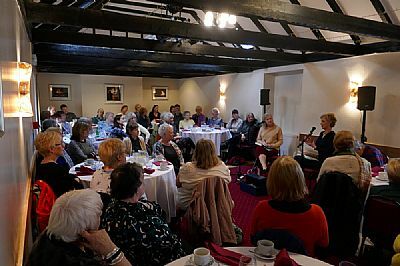 SALLY MAGNUSSON was at the Elphinstone Hotel for a Literary Lunch discussing her first novel 'The Sealwoman's Gift' in conversation with fellow author Lesley McDowell. After a delicious lunch, the audience were treated to readings from the novel as well as an interesting discussion about many facets of the book. 'The Sealwomans' Gift' is published by Hodder in hardback rrp £16.99. Signed copies now in stock! 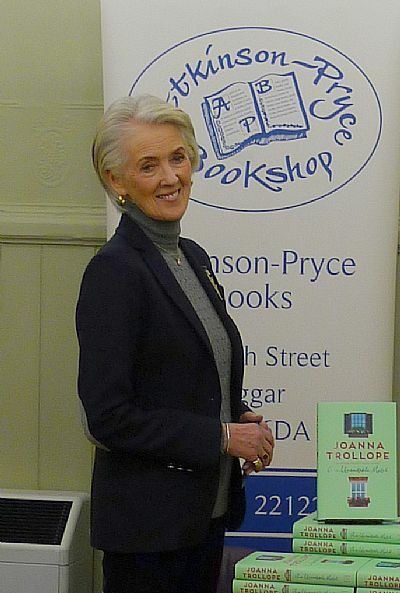 JOANNA TROLLOPE was at Biggar Corn Exchange. 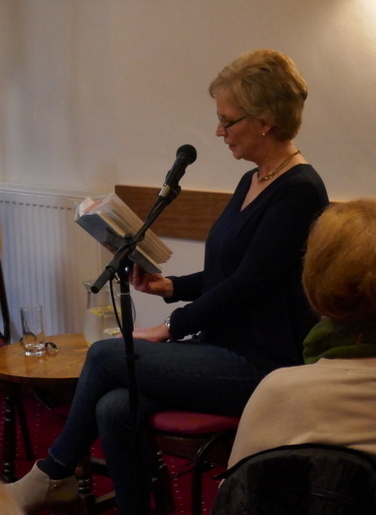 We were delighted to welcome one of Britain's best-loved fiction writers, Joanna Trollope OBE, to Biggar. With author and critic Lesley McDowell as chair, a full house at the Corn Exchange was treated to a delightful and interesting evening. As usual, Trollope (not the real one, as she charmingly points out), has taken a subject in her latest novel "An Unsuitable Match" which is thought-provoking and echoes a current zeitgeist. 'Nobody writes about family tensions better than Joanna Trollope' Good Housekeeping.